The speakers you’ve been tirelessly researching have finally arrived. You open the box with anticipation and place the speakers in the first spot you can find. You wire them up and start playing your favorite song, but your excitement slowly fades away as you start listening. Where is all the bass? Why are the vocals so muddy? Is the high end supposed to sound this muffled? These don’t sound like the reviews said they would. Speaker placement has a direct impact on how your speakers sound. The size and shape of your room, the materials in it, and your listening position all change how you perceive the sound coming from your speakers. Every room has a sweet spot and the goal of this guide is to help you find the spot that gives you even bass response, full sounding mid-range, and crystal-clear highs. Putting your speakers in the wrong spot can leave you wondering why your brand-new purchase sounds a bit underwhelming. If you’ve ever done a search for a speaker setup guide, you know that there are many rules (and often math) involved in finding the perfect position. Honestly, it doesn’t have to be that complicated. Take a look at the shape of your room. You want sound to travel the length of the room with the speakers placed close to the shortest walls, if possible. 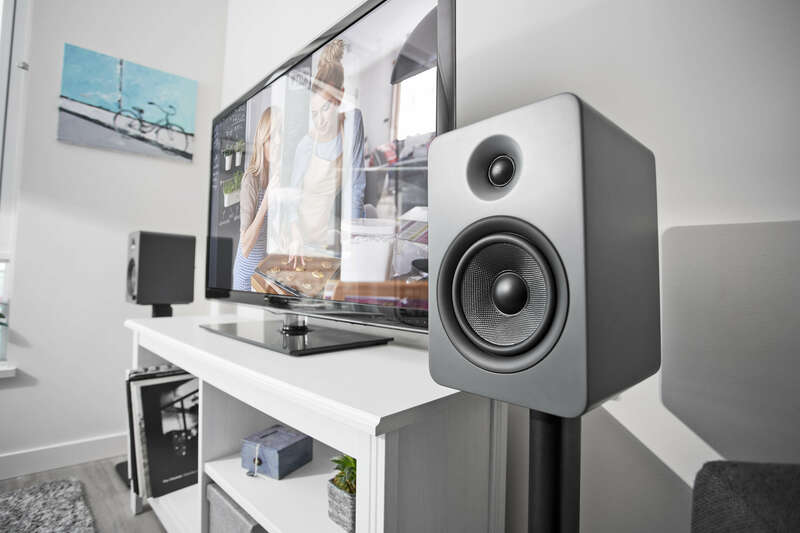 It’s good to have a minimum of 1 meter (3 feet) of space between the wall and the speaker to even out the upper-bass tones that can make your speakers sound “boxy” if they’re overemphasized. 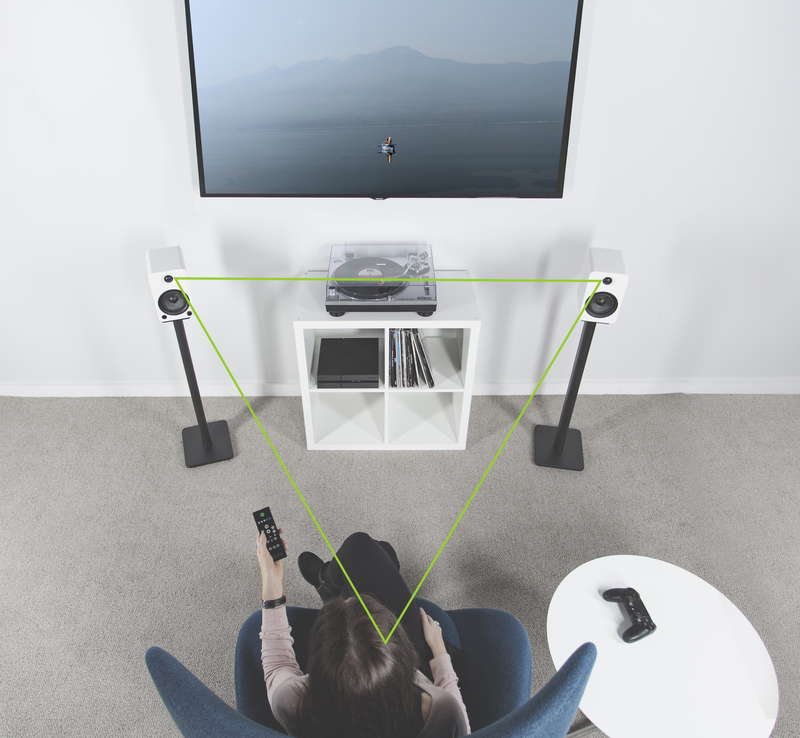 Placing your speakers in a triangle formation relative to where you’re seated will ensure your ears pick up the full stereo image. If the distance between each of the three “points” of the triangle are equal in length, even better. You will want to avoid having your seating position located directly in the middle of the room, as that could result in uneven bass response with some notes being too loud and some being too quiet. 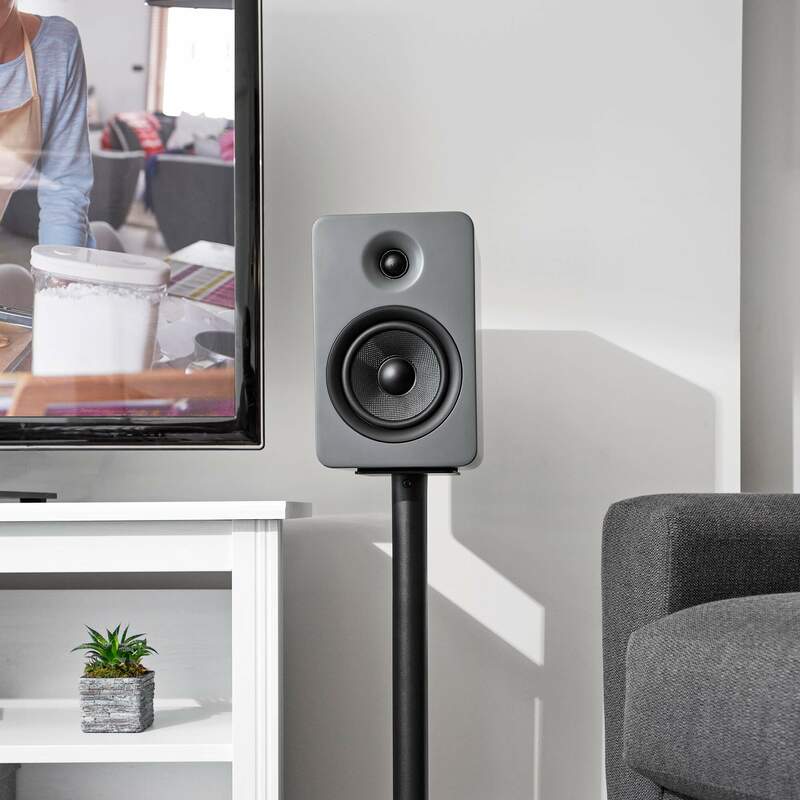 You’ll want to keep in mind that sound takes on the characteristics of surfaces that it hits, and your speakers will reverberate against any surface that they are sitting on. Speaker stands are a great way to avoid reverberation as they isolate the speakers from any surfaces that may add undesired reflections and noise. Stands should be heavy and solidly assembled with dampening on the surface that the speaker sits on. Low quality stands may rattle, resonate, and improperly dampen the speakers which can exacerbate the issues you’re trying to avoid. Keeping the tweeters level with your ears is also important for high-end clarity, which stands also help to achieve. This is applicable for both home theater and desktop applications. No matter how you use your speakers, you want them in line with your ears and isolated from the surrounding area. Most powered speaker pairs have an active and passive speaker. Take a look at the manual to find out which speaker plays the right channel and the left channel. Kanto speakers play the left channel through the active speaker. Always place your Kanto active speaker on the left of your setup to prevent inverting of the left and right channels. Once you’ve figured out a good layout for your speakers and sitting area, you’ll want to test how the speakers sound and make some final adjustments. Play your favorite song – one that you know very well. Move both speakers a few inches towards your seating area and have a listen. Keep doing this until the song no longer sounds as good. Once the song sounds off, move the speakers back to where the song sounded great. You may have to move the speakers closer to the wall to get the best sound, depending on your room. Now do this with the angle of the speakers. Start with the speakers oriented perpendicular to the wall. Rotate them inward until the song sounds muffled, then rotate them back until you’re happy with the sound quality. At this point, you should be able to sit back, relax, and enjoy your favorite tunes! We’d love to see your speaker setup. Send us your pictures on Facebook or post to Instagram using the hashtag #kantoaudio.